An additional 4kg will be added to the minimum weight for Drivers using the PRD Galaxy engine in all weight Divisions within the TaG 125 Class. This will see the minimum weight for Drivers using this engine elevated to 160kg (Light), 170kg (Championship), 180kg (Heavy) and 180kg (Masters) respectively. This adjustment has been made after assessing various data from results at recent events and feedback from competitors. This change will be implemented with immediate effect. There will be no change at this point in time to the Class Rules for the TaG 125 Restricted Class. Drivers using the PRD Galaxy engine are advised of a Homologation Bulletin that has been released today regarding an updated cylinder head (view the update bulletin by clicking here) This cylinder head is now being supplied with all new PRD Galaxy engines. 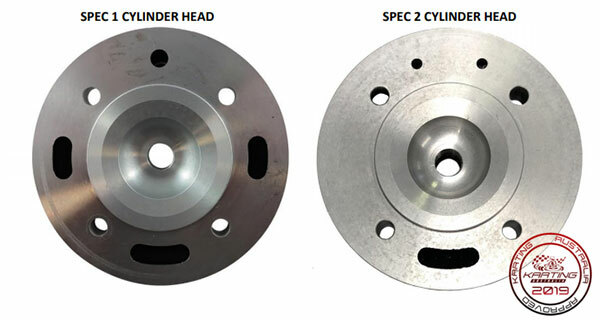 KA homologation update shows the reconfigured water jacket for PRD cylinder heads. Karting Australia will continue to actively monitor the performance of the engines closely and assess any adjustments that may be required. Any adjustments made will be made in the interests of ensuring that, as best we are able, engines are equal in performance across the TaG 125 group of Classes.